How do you suppose the “Goldfish” painting of Henri Matisse would look if he were painting it in the year 2014? Goldfish were a new craze in Europe in Henri Matisses’ time, and they became kind of an obsession with him for awhile. He painted his work of art called “Goldfish” in 1912. He has nine paintings that include goldfish in them. Probably the most outstanding thing about his Goldfish painting is the bright orange color of the fish. They contrast beautifully with the bright greens of the plant leaves and the subtle pinks in the flowers and wallpaper. Using Henri Matisse’s painting as a starting point, we’ve changed the fish to tropical fish, instead of goldfish, and put them in a modern fishbowl. You’ll find the tutorial for this project, Modern Mattise, in the 1st Grade Projects Gallery in the sidebar. 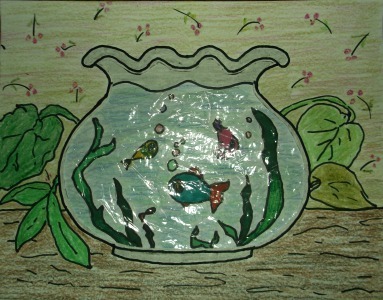 This entry was posted in Categories and tagged 1st grade, art and crafts for kids, art by mattise, classroom art projects, fishbowl art, goldfish, goldfish painting, henri mattise, modern mattise, painting, tropical fish, tropical fish in fishbowl. Bookmark the permalink.